The style is very much based on late 1960s-early 1970s music, primarily bluesy and psych rock. However Ape Skull inject that particular sound with a healthy dose of adrenaline as they deliver all the soul and fire that was good about this type of music and they thrust it out there with pure grit and surging grooves This is down and dirty bluesy rock music with an edge and plenty of heart and it sounds like the band is having a good time. The first track ”Lazy” reminds me a little of Cream and vocally as well. It is a good tune to start the album with, as it showcases their style and sets the stage for the songs that follow; “So deep” is the second track and bears resemblance to Grand Funk, vital and up-tempo with fantastic scorchwork by leadguitar player Fulvio Cartacci, who truly shines on this album. This Italian power trio puts 110% into every song and that effort comes through your speakers as pure energy. My personal favorites are “Make me free”, the aforementioned “So deep” and the Captain Beyond like “Take me back” but this is one of those albums where you can pretty much take your pick and be satisfied. They have even paid homage to obscure seventies period with covering Orange Peel. Yep, these guys are yet another welcome vintage rockin’ addition to my collection. 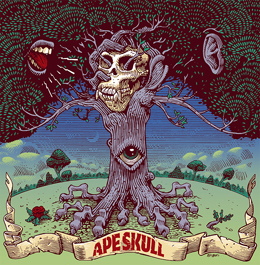 Fans of 70s music should certainly consider Ape Skull as one of their required listens of 2013.